Wondering what to do in Old San Juan? 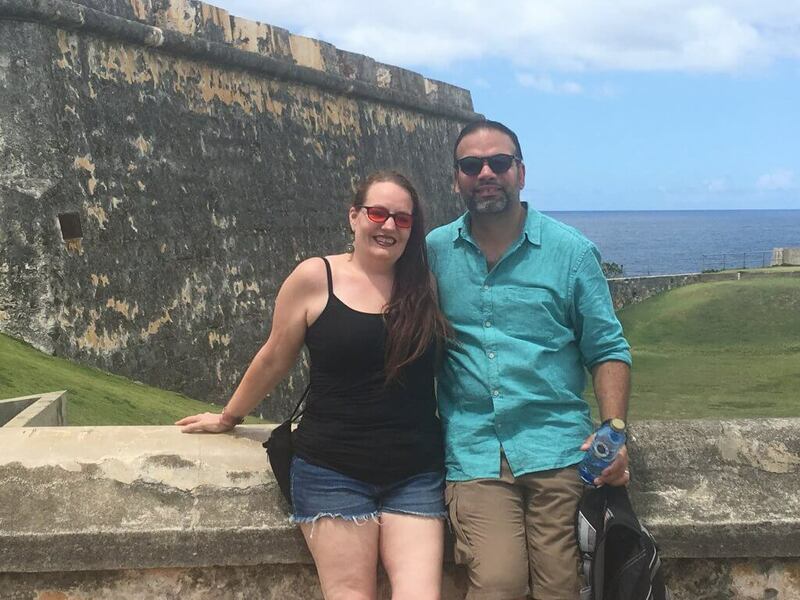 On our three-day trip to Puerto Rico, we experienced the rich colonial heritage of Old San Juan, a city unrivaled in the Western Hemisphere with over 500-years of architecture and history. We highly recommend spending at least one day (or more as we did) in the old city. We spent several hours wandering the scenic cobblestone streets, imposing walls that surround the old colonial city, fascinating museums and Spanish-built forts designated a UNESCO World Heritage site. We stepped inside El Convento, a hotel in Old San Juan, an old monastery adjoining the San Juan Cathedral square. The convent’s construction dates to 1646 but has been transformed into an award-winning boutique hotel with a restaurant serving traditional Puerto Rican cuisine. You need not be a hotel guest to enjoy this old world charm and elegance of this lovely gem of a building. It is beautiful. El Convento makes the top of our list for luxurious places to stay in Puerto Rico when we return. I loved the archecture—and these huge doors! San Juan Cathedral is the oldest building in the walled city. I wanted to see Ponce de Leon's tomb but it was not open without calling ahead--next time. Across the square stands the second-oldest cathedral in the Western Hemisphere—Cathedral of San Juan Bautista. The cathedral contains two interesting dead people. Juan Ponce de Leon entombed in a marble tomb since 1908, the waxed dead guy—San Pio (Saint Pius). If you enter the rear of the Cathedral of San Juan Bautista, you will find the tomb of Juan Ponce de León about half-way down the north side aisle on the left in a large room. The waxed-coated, mummified remains of San Pio, lay in a glass box is in the main sanctuary on the right-hand side. The first-century Christian martyr was brought to Puerto Rico in 1862 from the catacombs in Rome. This church had beautifully restored murals and the El Cristo de Buen Viaje (a large crucifix) reportedly rescued from a sunken ship off the coast of San Juan. We went into the basement to see the small catacombs. A trip to Old San Juan would not be complete with a visit to these two old forts. San Cristobal Fort was constructed in 1785. This massive military complex is the largest Spanish military complex in the Americas. El Morro has sweeping views of San Juan Bay. We peered over the wall right outside of El Morro. There were unique grave markers standing in the Santa Maria Magdalena de Pazzis Cemetery. These were just a few of the many wonderful things to see and do in Old San Juan. We had a fantastic time in Puerto Rico, and can’t wait to return! Want more ideas for things to do and see in Puerto Rico?